LOVE RED – ESPECIALLY WHEN IT’S BAKELITE . . . . . . . .
Can’t say for positive-positive, but I have my suspicions. Absolute confirmation can require a chemist’s lab but, anyway, what a cute little bangle bracelet this will be for summer – or any time. Love the shape. Love the color. Love the mystery. What could be better? BEAUTIFUL MID-CENTURY HAT IN EMERALD GREEN – TRUE VINTAGE MADE IN FRANCE. Here’s Stella kitted out in a rather mod mini version of the “mid-century synthetic knit coat”. It seems like these were very popular between about 1965 and 1975, for common everyday wear – especially Spring and Fall. This was definitely not haute couture, but has an excellent cut and tailoring, with good quality fabric. On the purely fashion side, very cute and has a little bit of military influence which was common then, too (metal buttons, epaulettes, decorative pockets). Looks like the stuff that was coming out of British fashion. 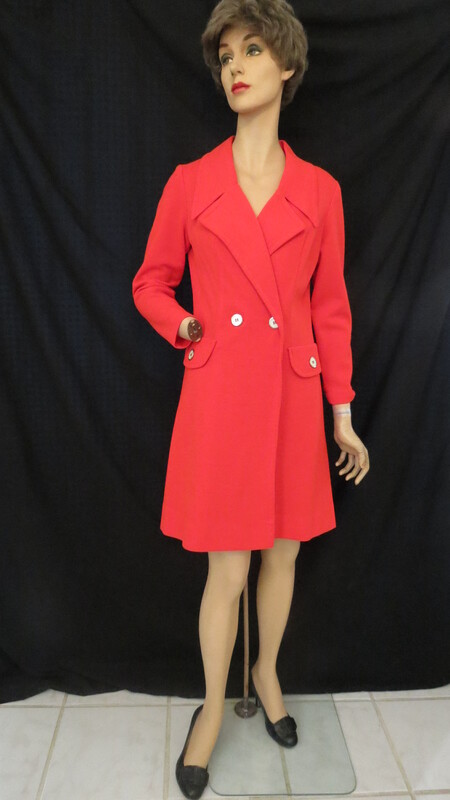 During every era when a standard skirt length was recognized, women had to have coats of the proper length, too. Unless it was a car-coat or jacket, they wouldn’t want the hem of a skirt hanging below and a knee-length coat could look kind of frumpy over a mini skirt. Fortunately for us, the tyranny of style is pretty much over and we can be unique and stylish in any way we like, whenever we like. Where the distinction comes in is whether we go with good design and quality (a.k.a. elegance) or with whatever is on sale at the mall this week. 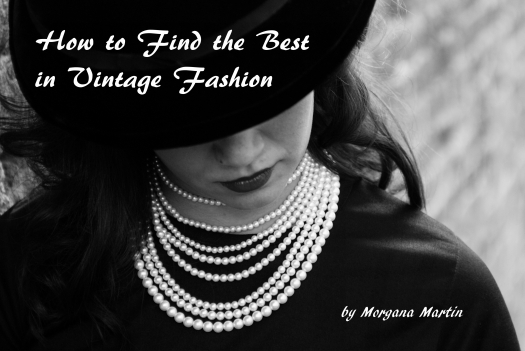 Finding true vintage fashion items is not rocket science, but it does involve many bits and pieces of knowledge, skill and experience that come together. They may seem simple and boring by themselves, but together they have made me the successful sleuth I am! Of course, there are more details involved with each one, but the basic idea is where to start. FINDERS’ CLUE #14: DON’T BE THROWN BY SIZE LABELS IN VINTAGE GARMENTS. IF YOU’RE NOT REALLY SAVVY ABOUT THE WAY SIZES HAVE CHANGED, TRY IT ON! IT JUST MIGHT FIT YOU . . . . . . . . . .
A PRETTY LITTLE TRUE VINTAGE DAY DRESS FROM THE 1950'S – EARLY 1960'S. SNOWY NIGHTS – TRUE VINTAGE PJ TIME . . .
Fabulous true vintage PJs from the 1950s or early 1960s. How interesting – these have a motif of hand fans but are clearly a boys’ or small men’s style. It’s got wonderful big plastic buttons, piping on the pocket, cuffs and collar and a vintage label. The beautiful cotton fabric and the print are so cool, you just can’t beat original vintage! Nothing else looks or feels the same. Lovely to snuggle up in these during the wintry weather . . . .
BOOK: HOW TO FIND THE BEST IN VINTAGE FASHION – AVAILABLE ON AMAZON.COM.